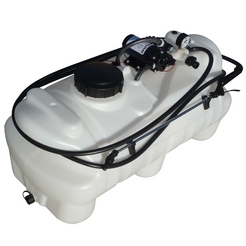 Complete spot spraying kit can be mounted on to pick up, ATV, mower etc. Ideal for weed killing on a larger scale and driveways or for watering large areas of grassland (or ménage surfaces). Kit includes spot sprayer, Lance and hose, and 95L tank. Boom and ATV mounting kit sold separately.